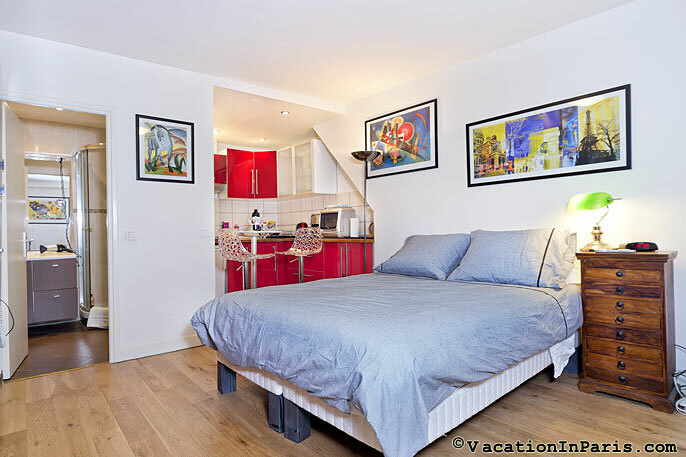 Sleeps up to 2 - Cozy & Quiet with Air Conditioning - Best Location in Paris! 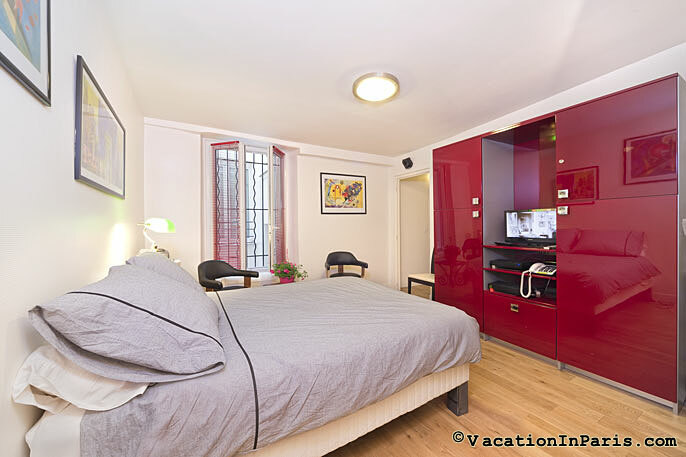 Experience the charm, character and life of old Paris in this studio in a historic and beautiful 17th century building. Located in the prestigious 2nd district, a “Quartier” rich in history and one of only two in the city to retain a village atmosphere. 30 Night minimum stay. Prices are in US$. Mandatory cleanings during stay required. 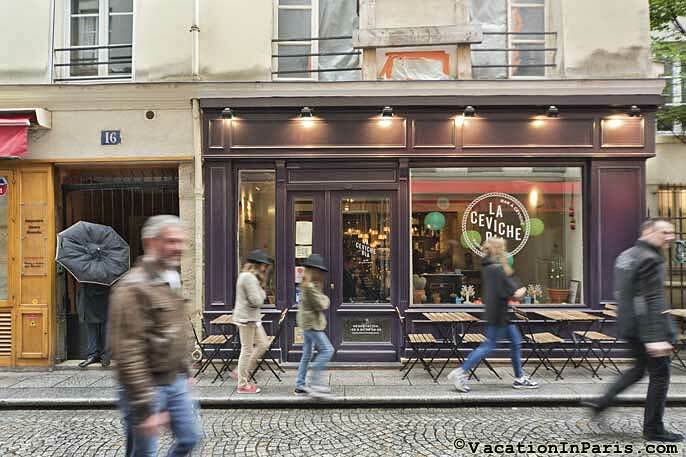 Situated in the historic Montorgueil district, rue Marie Stuart is a small and narrow cobblestone street extending about 50 meters between rue Montorgueil and the arcades of the Passage du Grand Cerf. 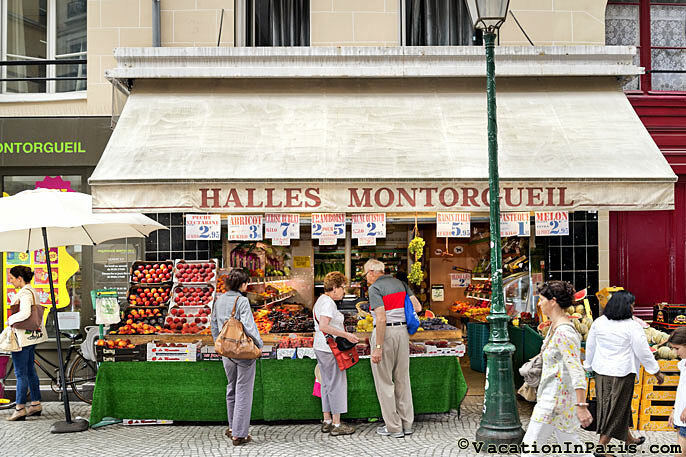 Located in a pedestrian district full of small shops, cafés, restaurants, bakeries, markets and a steady stream of Parisians, rue Montorgueil is the last remaining vestige of the great "Halles de Paris" - the central market that moved out of Paris proper in the late 1960's. 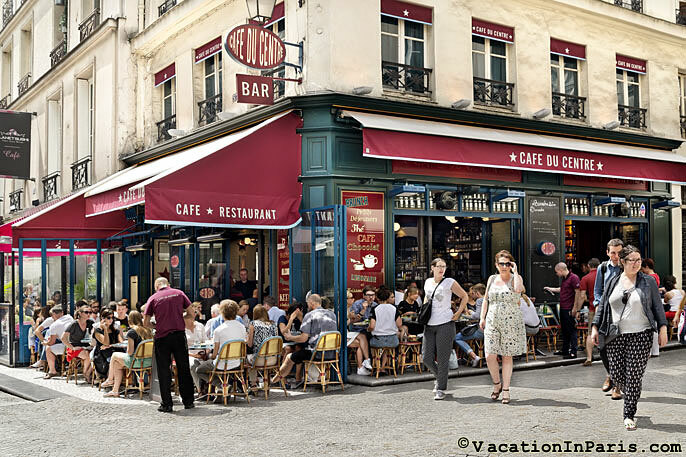 It is one of the most lively and picturesque parts of Paris. Small shopkeepers sell fresh flowers, fruits, vegetables, fish, and an assortment of meats, cheeses, and bread in open shops. Some of the restaurants and stores date back as far as the 17th century! Enjoy the village feeling and sense of place. 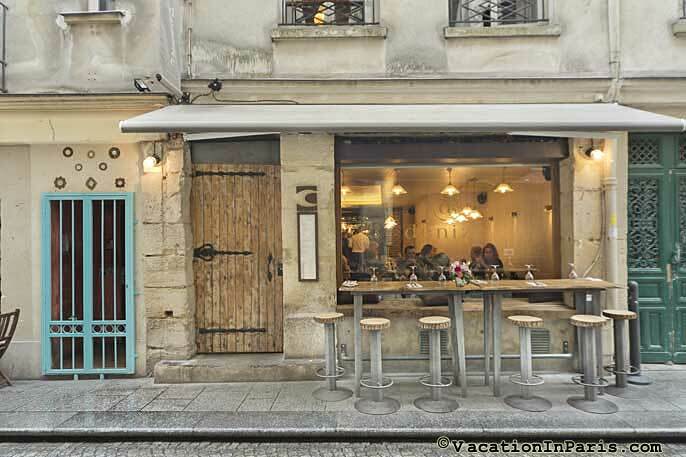 You will find the bustle and discriminating ambiance of Paris until late at night on rue Montorgueil. But just step into the building on the rue Marie Stuart and leave all the hustle and bustle behind. The building has been completely renovated in the past 10 years in order to modernize the infrastructure while maintaining its historical integrity. It features a locked grill at street level and a locked entrance door to the stairwell. The studio has a new security lock. Quiet, secure and convenient, the studio is situated on the 2nd European floor (3rd US) of this small well kept 17th century building. Looking onto the small interior courtyard, it provides a perfect balance to the lively world of the streets outside. 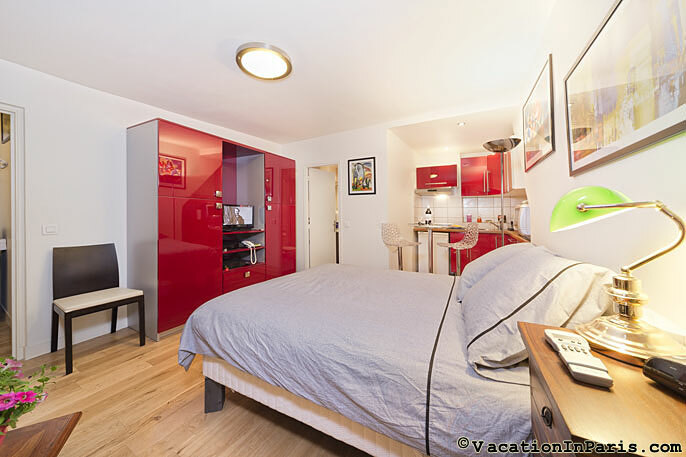 We have endeavored to maintain this balance of historic and modern in the renovation of our studio, making it a comfortable contemporary haven in the historic context of the building, Montorgueil quartier and our favorite city. 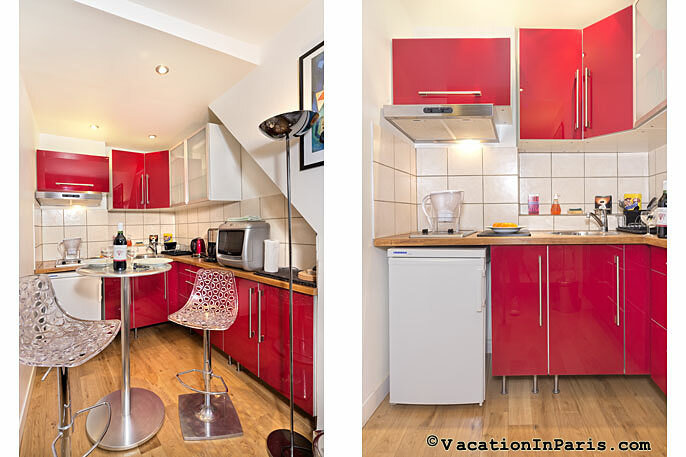 The apartment was renovated June 2009 and features a new oak floor, an open designer kitchen with a contemporary bistro table and stools, a bathroom with shower, a large mirror, sink and cabinet and a top of the line washer/dryer. Furnishings include a new (May 2014) top quality double bed, comfortable armchairs and a custom designed closet/media center housing a flat screen television, entertainment center, Wi-Fi and telephone. It also provides both hanging space and enclosed shelving for clothing. We installed a state-of-the-art, quiet and efficient Italian heater/air-conditioner made specifically for historic buildings was in 2012 to provide comfort winter and summer. 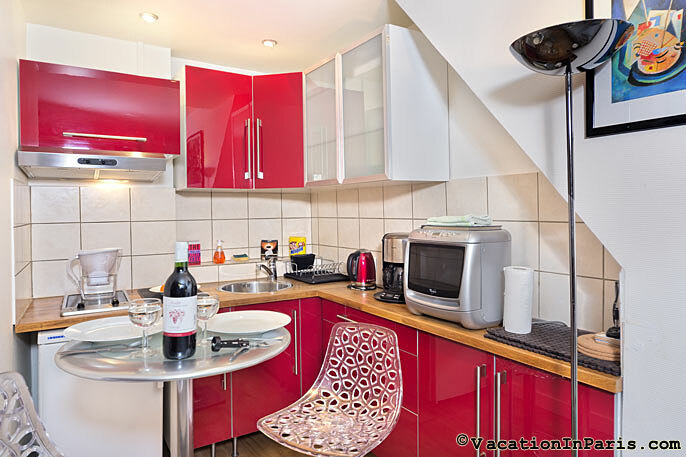 Rue Marie Stuart is located in the heart of Paris. 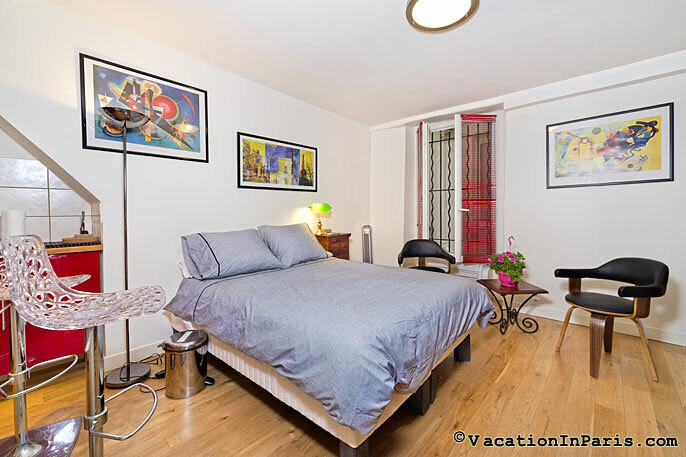 The Seine, the Louvre, the Garnier Opéra, the Grands Magasins, the high fashion district of the Faubourg St Honoré, the Pompidou Center, the Marais district, the Sainte Chapelle, and the Latin Quarter are all within easy walking distance. The same is true of the shopping center at Les Halles, the Palais Royal, and the Tuilleries Gardens. In the nearby Forum des Halles, you will find a large selection of shops including the largest FNAC (books, films and music) in the city, a large public swimming pool and a Cineplex, complementing the variety of cafes, restaurants, and shops on rue Montorgueil. Transportation could not be more convenient from this fantastic location. 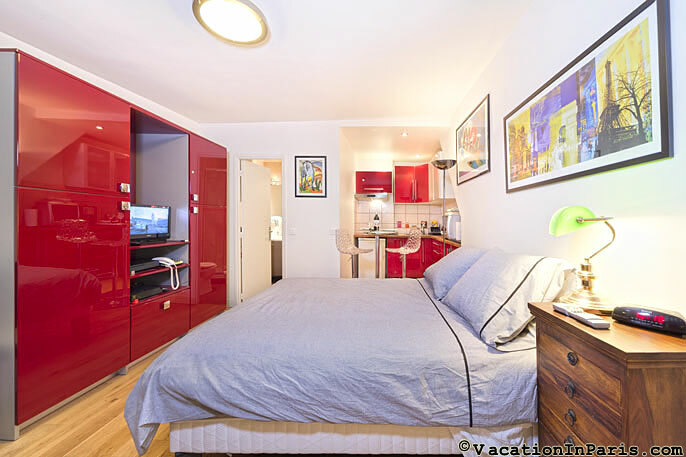 If you cannot walk where you want to go, there are three metro stations (les Halles/Chatelet, Etienne Marcel, Sentier) and three transit lines (RER lines A, B and D) within a five minute walk of the apartment. The central bus stop at Place Chatelet is also within a few minute walk. The apartment is located in the same building as our apartment ID 179 and next door to apartment ID 79. 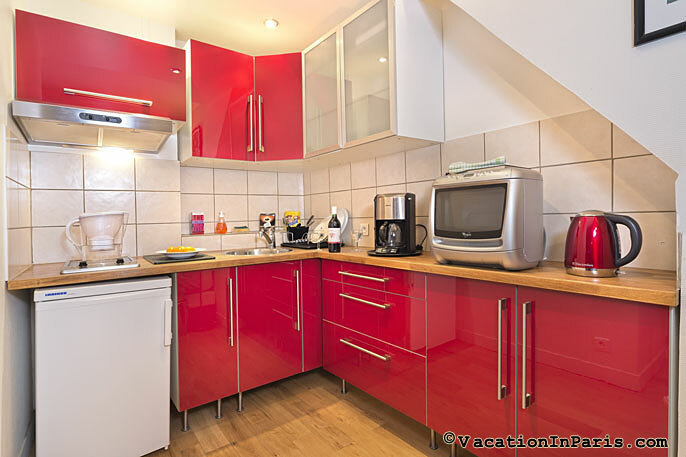 This is a perfect combination for two or three families traveling together but yet want separate accommodations. 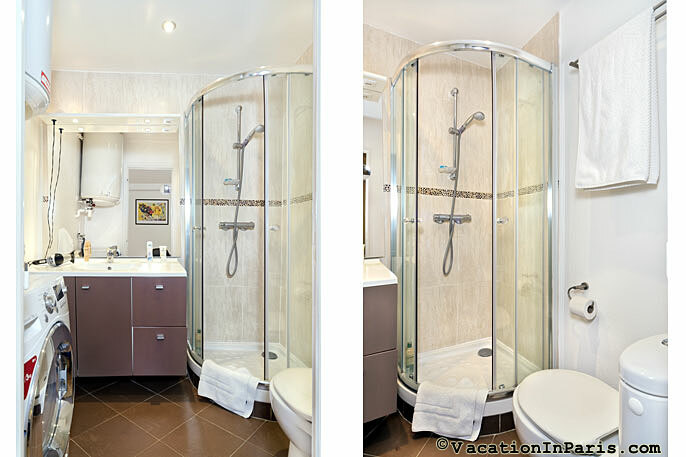 Together, the three properties can accommodate up to 10 persons. 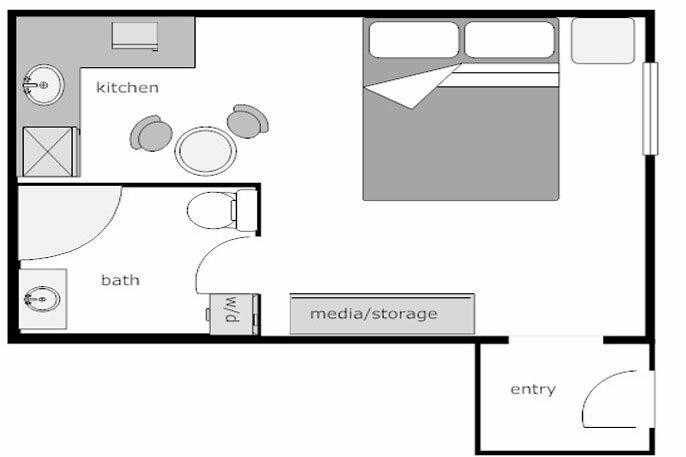 This vacation rental apartment requires a “Meet and Greet” - guests will be met at the apartment and given keys at that time.